Assessment The podiatrist goes through the medical history of the patient, discussing any conditions or injuries the patient previously encountered that may be contributing factors to any current conditions. The podiatrist begins the lower extremity biomechanical assessment. This includes orthopaedic assessment and clinical gait analysis. This is followed by a review of footwear with recommendations advanced based on lifestyle and activities. Finally, a 3 dimensional impression of the patient’s foot is captured or what is known as a ‘Anatomical Volumetric Foot Model’ [AVFM]. This is a physical or digital model that captures a person’s three dimensional plantar foot anatomy when the foot is non weight-bearing, semi weight-bearing and fully weight-bearing. Foot Modelling A digital AVFM must use actual 3 dimensional data points taken directly from the foot to duplicate plantar foot anatomy. The most common examples include laser 3D scanners, stereo-digital 3D imaging systems and pin array systems. A physical AVFM captures the foot anatomy through direct contact to duplicate plantar foot anatomy. The most common examples see plaster of paris casts used or foam impressions taken directly from the foot. Any material or method that uses direct capture of the entire plantar foot anatomy creates an AVFM. vacuum press, where the shell is moulded using a vacuum press from carbon fibre or carbon plastics including: polypropylene, copolymer, carbon graphite or laminate resin with EVA. The direct milled process sees the orthotic device fashioned from a block of the chosen shell material usually a Thermoplastic such as Polypropylene. From here the device is machine sculpted and shaped to meet the patient’s needs. This method is suitable for durable, long-lasting devices that accommodate all modifications. The vacuum press method sees the heated shell material placed over the positive cast model, and moulded around the model using a vacuum press. This method allows for a variety of shell materials such as copolymer, XT Sprint or TL2100. Devices manufactured via this process are generally lightweight, offering greater flexibility and suitable for dress wear and sports wear such as football boots. Depending on the style of orthoses, there are limitations to the modifications that can be made to the vacuum pressed device. 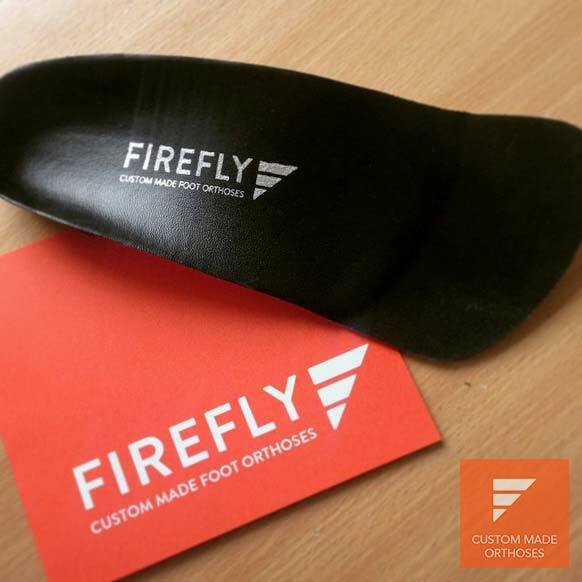 The process of finishing the orthoses is a combination of computer aided design and manufacturing, coupled with craftsmanship. 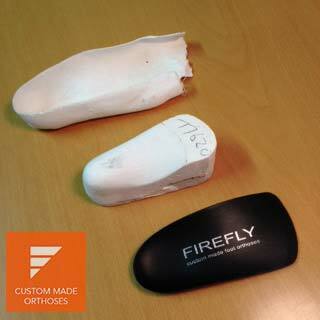 Firefly Orthoses’ highly skilled technicians finish the orthotic devices to exceptional standards. Our technicians not only shape the orthoses to meet the contours of the foot, but further modify using postings, padding and additions to ensure the foot is balanced through the gait cycle. The finished device must meet the design requirements as specified by the prescribing physician, taking into consideration appropriate medial and /or lateral arch fill, lateral column expansions, heel expansion, and intrinsic forefoot and or rear-foot corrections. Cast, positive mold and orthotic. The image above shows a plaster of paris cast of the patient’s foot, followed by a positive mould of the cast and finally the finished custom made Firefly Orthotic Device. The combination of materials, additions and modifications available to meet the patient’s needs can be viewed on our products page, and are combined alongside a suitable top cover material of either EVA, expanded vinyl, neoprene, open and closed cell polyurethane, cork and leather. 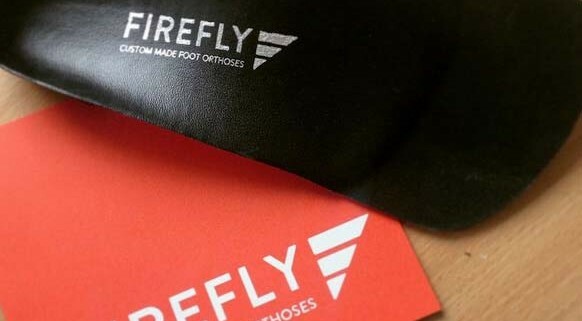 Firefly Orthoses Fit The custom-made orthoses designed and manufactured by Firefly ensure enough flex for functional pronation and comfort and enough stiffness to maintain arch height for normal function.